THE Australia we know and love today will look very different in just three decades, according to a top forecaster. It includes apartments with indoor greenhouses where residents would source and grow food, virtual reality "a part of everyday life" and in a darker tone, the end of privacy with surveillance systems installed in phones, fridges and washing machines. Barrie Barton, forecaster and head researcher for Right Angle Studios, was commissioned to predict the future of Australia in 2049 thanks to the film Blade Runner 2049 - the follow-up to the cult classic Blade Runner. His business has revolutionised key Australian hot spots including Sydney's Golden Age Cinema and working with the Commonwealth Bank for its Future Home Insights Report. Forecasting his view on what Australia will look like in 31 years, Mr Barton predicted what our life will hold in four key areas - technology, sustainability, entertainment and the home. "A lot of people think future forecasting is a really mystical pursuit but it's actually pretty logical," Mr Barton told news.com.au. "We were looking at population growth, seeing how many people were not only living in Australia but in our major cities, and by 2049 the numbers are immense - our cities will be vastly bigger than they are now. That helps us imagine what future we're likely to see." 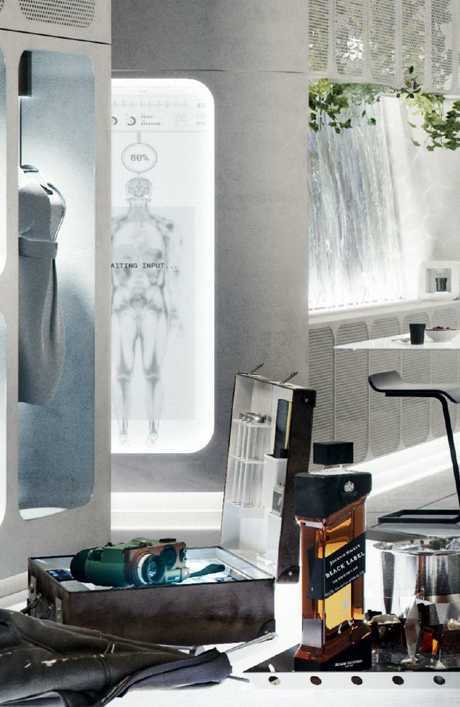 A “smart wardrobe” with scrolling digital display that tells you what to wear is just one of the cool predictions for 2049. According to the Australian Bureau of Statistics, "Australia's population at 30 June 2012 of 22.7 million is projected to increase to between 36.8 million and 48.3 million in 2061, and reach between 42.4 million and 70.1 million in 2101." Mr Barton said that if world leaders weren't to act today, sustainability for Australia was "the mother of all issues", claiming our climate was "apocalyptic" thanks to our reliance on fossil fuels. "It seems like half the planet is on fire. "If we can behave now, not draw so much resource from our planet, we have the possibility of carving out a different future for us." Mr Barton said it was likely to be less of a robotic future ahead of us, yet mundane items like washing machines would be "really smart" and potentially more dangerous. A holographic personal assistant in front of the Sydney Opera House. Our most optimistic 2049 scenario is that nature will be supercharged. 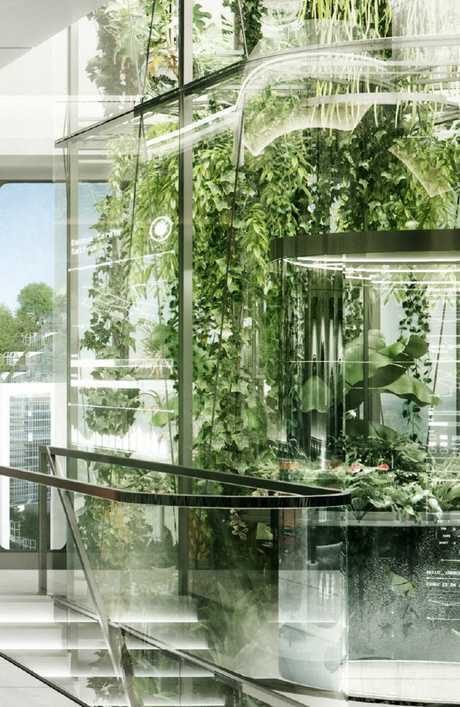 In buildings of the future - whether a high-rise apartment or warehouse - a self-monitoring indoor greenhouse provides residents with a nutrient-rich food supply. Plants have been genetically enlarged for maximum carbon capture and the urban landscape beyond is transformed by an abundant canopy of green. The perfect crop field could be inside on a smaller scale, growing an abundance of greenery with controlled light, temperature, humidity, air quality and nutrition. In 2049, it won't be uncommon to walk into a car showroom and before you say anything, the dealer will already know your name, employment status and earnings - unless you've explicitly opted out. But most of us don't know how our data's being used or how to take back control of it. What is truly terrifying about the future are the objects below known as forms of "sousveillance". Your smartphone that knows where you are, your voice recognition centre that hears what you say, your fridge that knows what you eat, your watch that knows how much you exercise ... those are the real spies of the future. Buildings of the future will have indoor greenhouses. 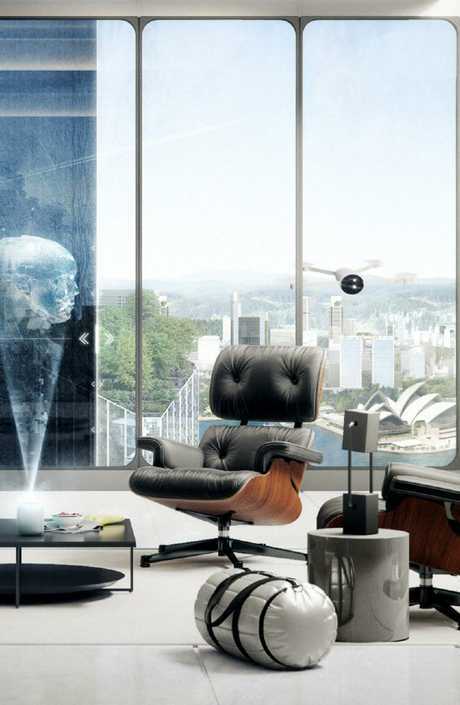 By 2049, adults will have been reared on game-like, immersive entertainment and entirely accustomed to seeing the world with a digital overlay. We're already seeing media layered with contextual, interactive elements for a deeper and more immersive experience, but these will be commonplace by 2049. The danger is that we become so wrapped up in these utterly convincing imaginary worlds that we forget to pay attention to what's happening around us in the real world. When space is at a premium, every design element and piece of furniture has to work extra hard to justify being there. With the exception of one or two items (such as the collectable designer chairs in our CGI), every piece of furniture will have a smart layer that makes your life easier. For example, the wardrobe that analyses your calendar and weather data to make appropriate outfit decisions. It may sound farfetched, but several technology companies are creating very similar prototypes. At this year's annual International Consumer Electronics Show, Panasonic built a clothes-folding robot and a fridge that responded to voice commands. It's reassuring to think that while the technology of 2049 will seem incredibly advanced compared to what we have now, much of what we value will stay the same. And if there's anything we don't like about this vision of the future, we can still change it. The DVD and Blu-ray release of Blade Runner 2049 is out next week.